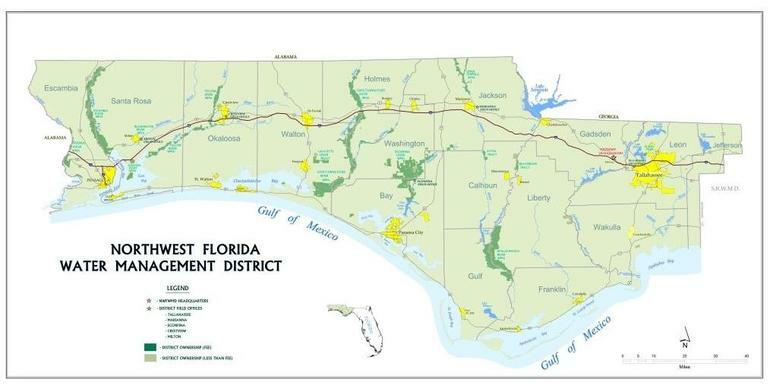 One of five water management districts created by the Water Resources Act of 1972, the Northwest Florida Water Management District is charged with managing the water resources of the Florida panhandle. The District works to protect and manage the water resources in a sustainable manner that benefits both the people and natural resources across its 16-county region, pursuant to Chapter 373, Florida Statutes. The District serves approximately 1.37 million residents and covers an 11,305 square mile area, including Bay, Calhoun, Escambia, Franklin, Gadsden, Gulf, Holmes, Jackson, Leon, Liberty, Okaloosa, Santa Rosa, Wakulla, Walton, Washington, and western Jefferson counties. The District works to protect ground and surface water resources, including the area’s springs, rivers, estuaries and bays, wetlands, and lakes. Within the District’s boundaries lie several major hydrologic basins: Perdido River and Bay System, Pensacola Bay System (Escambia, Blackwater and Yellow Rivers), Choctawhatchee River and Bay System, St. Andrew Bay System, Apalachicola River and Bay System and St. Marks River Basin (Wakulla River). The District focuses on its core missions of water supply, water quality, flood protection, and natural resource protection through a variety of activities, including water quality and quantity monitoring, research and planning, regulatory activities and permitting, and land acquisition and management. A nine-member Governing Board, appointed by the Governor and confirmed by the Florida Senate, oversees District activities by setting policy and administrating the District’s budget. The Governing Board appoints the District’s Executive Director, who directs all Northwest Florida Water Management activities. The Florida Senate confirms this candidate. The Northwest Florida Water Management District is an equal opportunity employer, with challenging positions in the professional, administrative, engineering, environmental sciences, and hydrologic fields.